Nose: Vanilla, honey, winter fruit – pears and apples, nutmeg, and faint notes of citrus, and cinnamon – with a very slight malt smell at the back. Palate: Creamy malt, honey butter, pears, green grapes, sweet spices, vanilla, and light notes of lemon boiled lollies. Mouthfeel: Creamy yet also juicy, medium weight, slightly warm. Neither oily nor dry. Finish: Crisp, slightly sweet and spicy, traces of vanilla. Most of the flavours die down after a not particularly long time, but sweet spices and the vanilla hang around for quite a while. My mouth keeps watering for the entire time the flavours hang around. Despite this technically being a No Age Statement whisky, we certainly don’t need to worry about a lack of transparency from Sullivans Cove – they’ve provided quite a bit of information about the whisky inside this bottle via a sticker that lists the batch number (DC079), the bottle number (799/1477), the barrel numbers used in this vatting (HH0293, HH0346, HH0387, HH0021, HH0025, HH0026), the date the youngest barrel was filled (11/07/2000), and the date this bottle was filled (12/03/2015). The main label also states that it is non-chill filtered, bottled at 40%ABV, and was made with 100% Tasmanian barley. 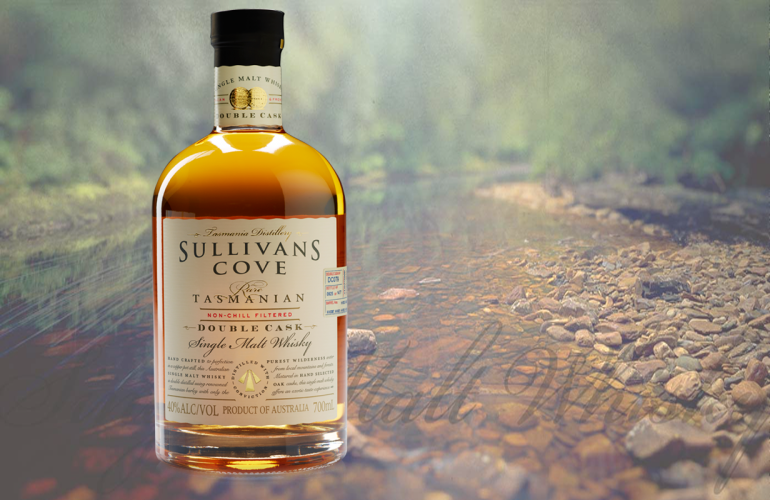 All Sullivans Cove whisky is made from Franklin barley that is grown on Tasmania, and is malted at the Cascade brewery in Hobart to Sulivans Cove’s specifications (the Cascade brewery and malting house are a whopping 18km by road from the Sullivans Cove distillery). The wash is also brewed at the Cascade brewery before being tankered to the distillery where it is double distilled in pot stills, barrelled, aged, and bottled. This whisky is a sibling of the Sullivans Cove French Oak, the whisky that won World Whisky of the year in 2014 at the World Whisky Awards, the first time a whisky outside of either Scotland or Japan had won the award, and scored 96.5 from Jim Murray in 2013 – along with a long list of other awards over the past few years. Saying that, I actually prefer the Double Cask to the French Oak; it’s softer, smoother, and creamier, and in my opinion a much easier drinking whisky – although if you ever get a chance to try the French Oak, take the dram; it’s worth every point it has been given. I really quite like the bottle that Sullivans Cove uses – simple, understated, nicely weighted; almost identical to the bottles that Bruichladdich use. One particular part of the bottle that I like – and this is likely to get me legions of Scots coming after me to string me up – is the screw cap lid (which is something we’re used to here in Australia, most of our wine and beer have screw cap lids). More distilleries should look into using screw caps – so much more convenient than cork stoppers. Despite now being Australia’s biggest whisky producing region – with 12 distilleries on the island, distilling in Tasmania was only legalised in 1992, after being prohibited by the colonial Governor (of the then Colony of Van Diemen’s Land), John Franklin, in 1838. Sullivans Cove’s master distiller Patrick Maguire has been involved in Tasmania’s whisky industry for longer than just about anyone other then Bill Lark (often labelled as the father of Tasmania’s whisky industry) – whom Maguire marched alongside of until he joined the Tasmania Distillery/Sullivans Cove distillery in 1999. This whisky is quite amazing – easily one of the best that I have had the pleasure of drinking. Soft, creamy, lots of vanilla, fruit, honey, and sweet spices; with a great balance and a strong finish.